Welcome to the 31 Days of Wrestling, ladies and gentlemen. Once again, we're at that point where we take a look back at the past 11 months of pro wrestling (and as much as possible, the last month as well) and cherry-pick one match for each day of December from a list of bouts that defined the year in our beloved sport. Most matches will be good, while some may not be; what matters is that they helped build the perception and reputation of the kind of wrestling 2017 produced for us. Wrestle Kingdom 11 last January 4 validated New Japan Pro Wrestling (NJPW) growing popularity outside Japan. From the increasing number of NJPW World subscribers to the high demand of merchandise from international audiences, NJPW decided to take a risk and expand their promotion to the United States. On May 12, 2017, NJPW United States Ambassador George Caroll announced the creation of the IWGP United States Heavyweight Championship during NJPW and Ring of Honor’s War of the Worlds. The title is part of the American expansion and it will be defended at future NJPW events in the U.S. as well as events held by ROH moving forward. We're happy to announce the IWGP United States Championship last night at #ROHWOTW. NJPW held a single-elimination tournament in Long Beach, California on July 1 and 2 during their G1 Special in U.S.A. shows with wrestlers from NJPW and ROH to crown the inaugural U.S. Heavyweight Champ and give locals a taste of what they’ve been staying up at odd hours in the morning for. Speculation ran rampant on who would take the crown, but after his performance at the Tokyo Dome earlier this year and the overwhelming support from international fans, the odds were in Kenny Omega’s favor. The only question that remained was who would be his final obstacle to the title. Having Tomohiro Ishii as this obstacle was, in hindsight, a solid move. 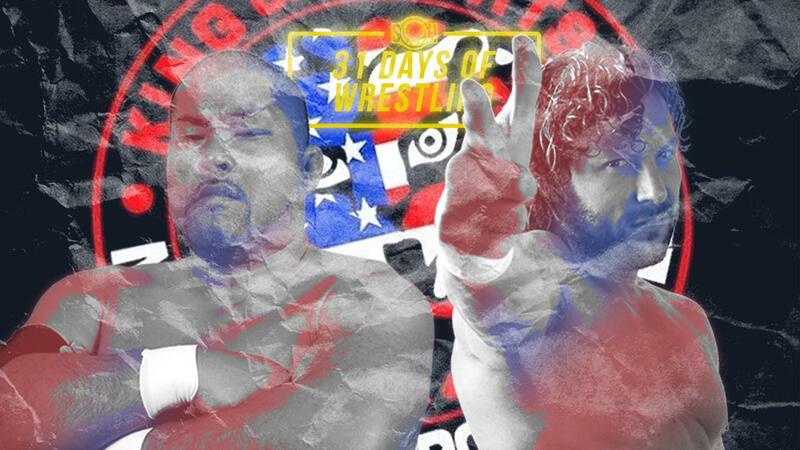 The handful of matches and moments these two have had were nothing short of incredible—barring their encounter during the New Japan Cup in March, which only fed into their story for the Long Beach shows. Their New Japan Cup match lacked the intensity that fans have come to expect from an Ishii/Omega encounter, even if it did last for almost 30 minutes. While there was no explanation for this at the time, it now seems that they saved up their energy, so to speak, for their encounters at Wrestling Dontaku and the G1 Special. What made the half hour-long encounter at Long Beach more incredible was the fact that, much like the G1 tournaments of yesteryears, Ishii and Omega burned through the second round and finals on the same day, not even 24 hours removed from their first round matches. Ishii worked through hurts accumulated from matches with the white-hot Tetsuya Naito and the technical master Zack Sabre Jr., while Omega muscled through fatigue from his encounters with Michael Elgin and Jay Lethal. The opening series they had in the ring belied their fatigue as it contrasted Omega’s deceiving speed and Ishii’s brute strength. Adding in a U.S. touch was their brawl in the crowd afterwards, a litany of chops that ended with a German suplex from Ishii to Omega to the barricades—a feat that Omega pays back much later with a brutal Dragon suplex to a waiting table from the apron after wrenching Ishii off his death grip on the ropes. This defiance from Ishii would define his style against Omega, the overwhelming crowd favorite, throughout the match. He’s not the favorite by this Elite-leaning crowd, but you couldn’t tell by the ferocity with which he pays back Omega’s back-to-back offense, or the awe the crowd shows for his unrelenting attitude. Frenetic is a good way of describing the energy of this match—frenzied, fast, and somewhat delirious. Yet it can’t be denied that Ishii and Omega are deliberate in pushing each other to the limit in this match that decided the direction New Japan will take in its expansion to the West. In choosing the foreign-born Omega to become its first champion, NJPW has shown that it is willing to forego certain holdovers from their relatively conservative business style to adjust for its non-Japanese audiences. In the hands of Omega, the U.S. Heavyweight Championship has steadily grown the prestige associated with it while crafting what kind of challengers it’s looking for. Juice Robinson, Yoshi-Hashi, and Trent Beretta are all young guns eager to prove their worth, had unique stories coming in their challenge against Omega, and perhaps excepting YOSHI-HASHI, has an established interest in the U.S. and Japan. While Chris Jericho doesn’t fit this profile, he still has, even past his prime, overwhelming fame around the world. Jericho challenging for the title also fulfills Omega’s promise to defend the title against all challengers, regardless of their location and promotion. Even though the match at Wrestle Kingdom 12 will surely have a lot of smoke and mirrors thanks to its no-DQ stipulation and Jericho’s age, it is a special interest match that is already paying dividends for NJPW. Time will tell if this actually translates to paid subscriptions, but with the 2018 they’re setting up, New Japan seems like they’re playing to keep those new free subs come the Dome. As for Ishii, the Stone Pitbull will be challenging for the NEVER six-man titles with Toru Yano and Trent come Wrestle Kingdom. This isn’t particularly worrying as he seems to be stepping into the role of a New Japan Uncle: to keep the peace in multi-man matches and give one hell of a performance when called upon to fill a championship match, singles bout, or the G1. It still doesn’t stop us from being bitter AF at the fact that he’s not gotten a singles match after yet another underrated year of performances that most 42-year-old wrestlers or younger would kill to have. 31 Days of Wrestling is Smark Henry's way of celebrating the matches that helped define wrestling in 2017.